I am a French native speaker, professional London based actor and voice over artist. From my home studio I will deliver a professional, clean voice over track. 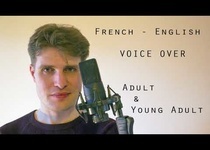 In French, I can...Read moreI am a French native speaker, professional London based actor and voice over artist. From my home studio I will deliver a professional, clean voice over track. In French, I can provide an accent from France or from Switzerland depending on what you need. I always take time to understand the essence of the project and what you want the client wants me to get from the script in order to produce a good result. Jason is a great professional, he nails the tone needed for the job at the first attempt, he's fast and efficient. Definitively recommended. Jason was amazing, he did a great job in no time. Highly recommended.